I have to admit to being a little sceptical when I first heard that Sister Act the Musical would be touring the UK. Its run in the West End was relatively well-received (not least by me, twice) but the show itself lacked a certain something to match up to the star quality of its cast, so I was pleased to hear both that this touring production was a reworked version and some excellent word-of-mouth in advance of its arrival at the New Wimbledon. And it was good word indeed as I really enjoyed the show third time around. An adaptation of the film of the same name in which Delores van Cartier, a nightclub singer, has to enter a witness protection programme which places her in a threatened Philadelphia convent much to her chagrin. But disguised as Sister Mary Clarence and appointed to the head of the dodgy choir which she soon whips into shape, she effects remarkable change on those around her which in turn raises their profile, jeopardising the whole undercover operation and everyone’s safety on the very day the Pope is coming to hear them sing. The changes made have added a much needed pace, especially to the opening section, but the real boon, as with the 2010 touring version of Les Mis, is being liberated from the unwieldy revolving set which frees up much of the action and movement. The show also benefitted, as musicals often do for me, from a greater familiarity with Alan Menken’s score which is tuneful, but wasn’t necessarily immediately catchy to my ears. This time round though, I was smiling in recognition at tunes such as ‘Fabulous Baby’, ‘When I Find My Baby’ and ‘Raise Your Voice (Baby)’ which sparkled here with great sound. Of course, having seen the original London cast, I couldn’t help but make comparisons between the two companies which is rarely a helpful thing to do. Cynthia Erivo rose to the challenge of Delores extraordinarily well though, a demanding leading role which she delivered extremely with aplomb, connecting well with Edward Baruwa’s Eddie (whose quick changes are still fabulous). Denise Black struggled though as Mother Superior, her comic timing was ill-judged and her vocal limitations exposed even in the speak-singing she has to do, and though I count myself as one of Julie Atherton’s adoring fans, I wasn’t 100% sure she was best suited to the role of the timid Sister Mary Patrick (though she smashed the hell out of ‘The Life I Never Led)’. The company of nuns are excellent throughout though, Jacqueline Clarke reprising her cantankerous Mary Lazarus to great effect. It was quite gratifying to see such a healthy-sized audience enjoying themselves so much; though many commentators would denigrate it as being not culturally worthy, the success of this show should not be underestimated, this is clearly what some audiences want. The enthusiasm bubbled over a little with the woman behind me who, when asked politely to stop talking during the show by yours truly, proceeded to inform in the interval that I had been exceptionally rude in interrupting her conversation and that I owed her an apology! 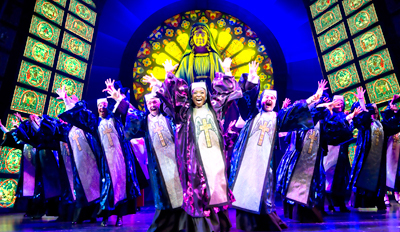 So noisy audiences and variable cast members aside, Sister Act the Musical still provides an evening of shining feel-good entertainment that ought to leave a smile on many a face.